Credit then to Art & Lutherie, whose current line-up of acoustics and electros are both tonally capable while undeniably eye-catching. 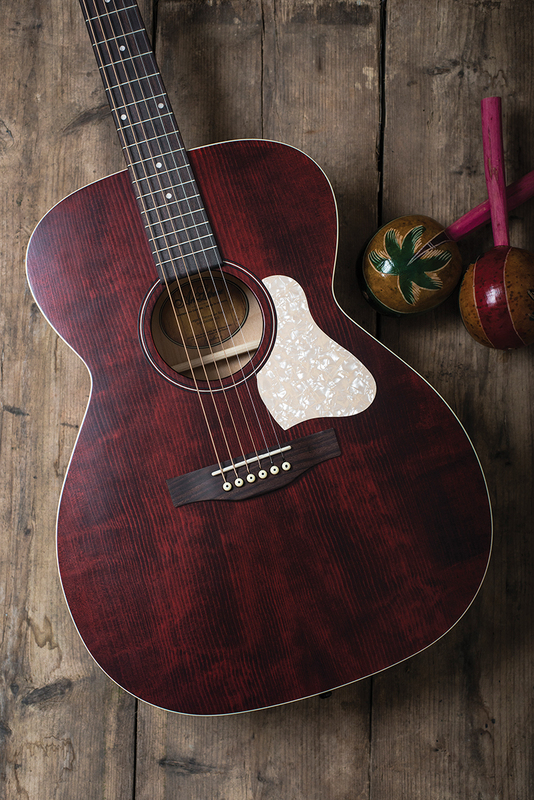 Back in our November issue we looked at the Roadhouse – a parlour sized acoustic – and very impressed with it we were, too. The stablemate on the bench here is the larger, Concert Hall-sized Legacy model. Different manufacturers use varying terms to denote this type of body size but, in truth, the legacy is basically the same dimensions as a Martin OM (Orchestral Model). 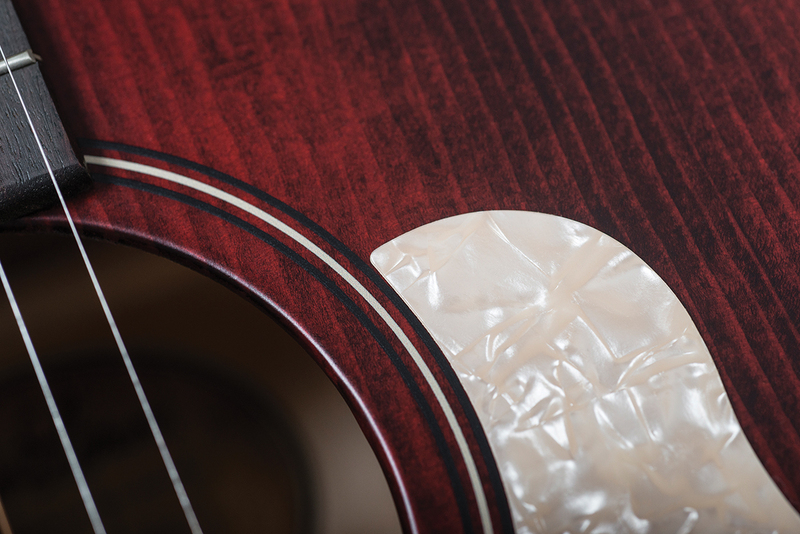 Seen by some as the optimum size for handling both strumming and fingerpicking duties, the Concert Hall is one of the most comfortable body sizes to play. 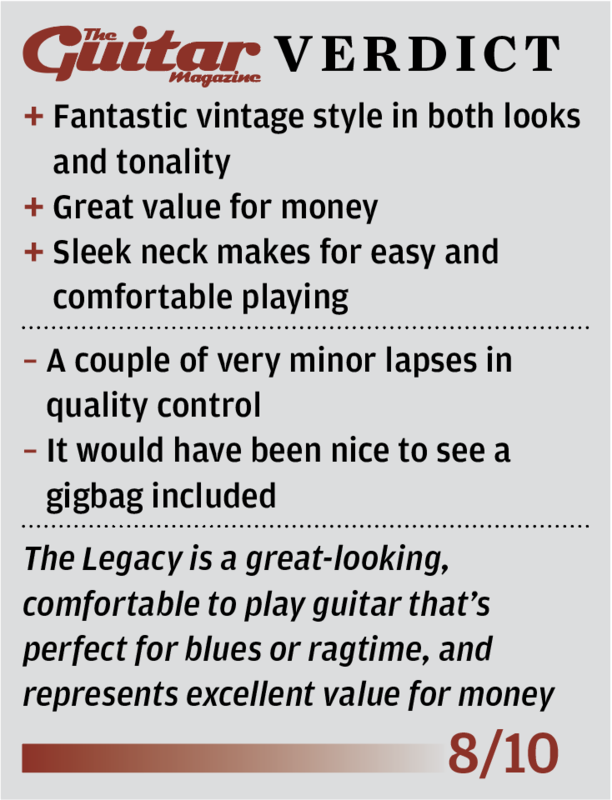 First impressions out of the box are that the Legacy is an attractive and rather striking guitar. There’s an obvious vintage character, but in some ways it feels very modern, too. The lines are sleek and sharp, and although the guitar harks back to the 1930s, it’s not old or tired looking. This blend of old and new is an intriguing mix, and one that just makes you want to pick it up and start playing. The cherry-coloured stain is thick enough to provide a rosy hue, but sufficiently thin to allow the grain of the solid Spruce top to be visible. The off-white binding, bridge pins and tuner buttons augment the stain, while the matching ‘Americana’ pearloid pickguard is the cherry on the vintage-vibed cake. The spruce top has been well book-matched, but the grain isn’t as ruler-straight as you can find on some similarly priced guitars. 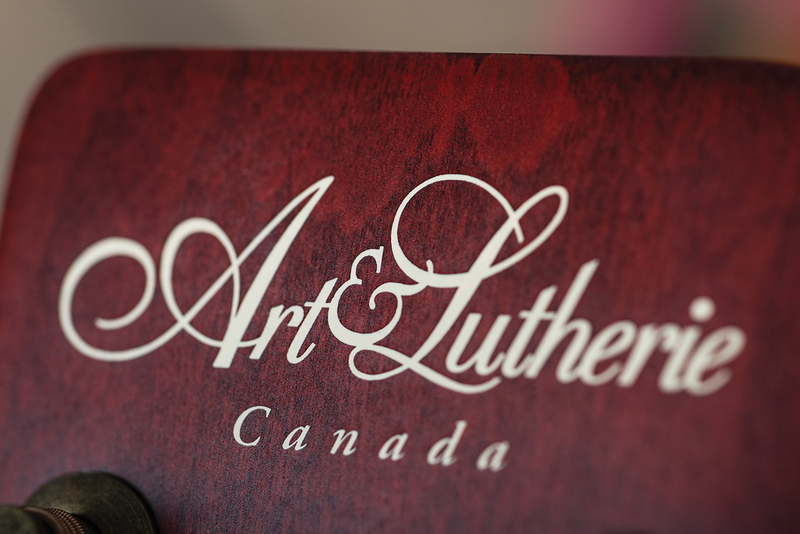 Art & Lutherie points out, however, that all the tops used on its guitars have been pressure tested, ensuring that this crucial part of the guitar’s look and performance is sufficiently rigid and stiff. Inside we were happy to find quarter-sawn Adirondack spruce has been used for the scalloped bracing. Adirondack is known as turbo-charged spruce and its inclusion here – on what is a relatively inexpensive guitar – is a real plus point. The Legacy’s back and sides is a wild cherry laminate. 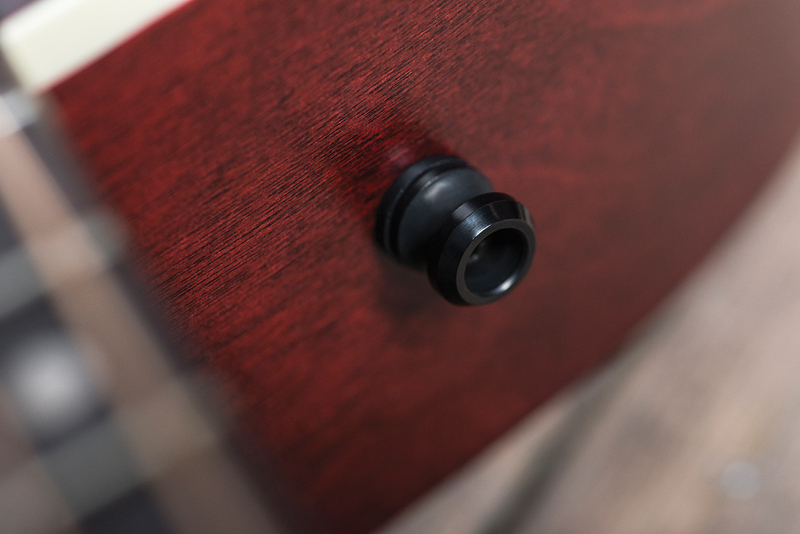 Sonically, cherry lands on the tonal spectrum between mahogany and rosewood. It’s a very balanced, almost neutral tonewood in that it doesn’t favour either the bass or the treble frequencies. 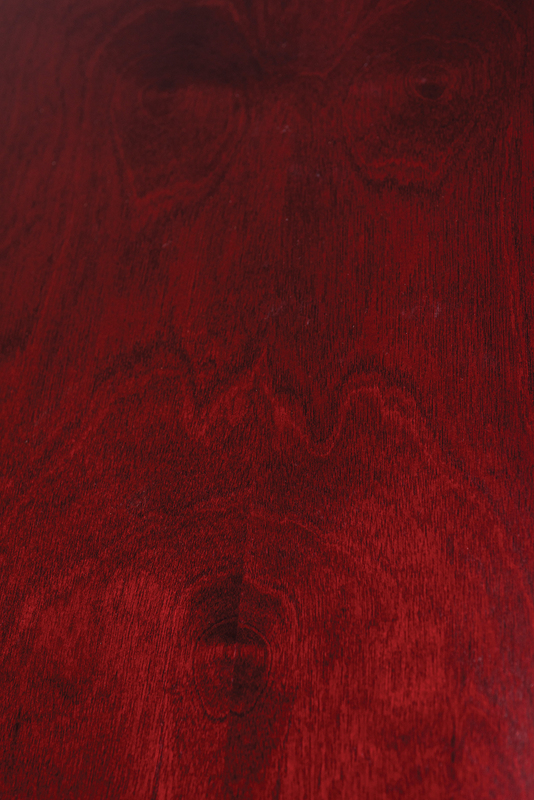 Wild cherry can also produce some vibrant grain patterns as is the case with our review model. The thin, semi-gloss finish not only gives the guitar an authentic aged feel, but is also shows off the textures of the tonewoods in use here. Elsewhere, the fingerboard and bridge are formed from rosewood, the nut and saddle are Graph Tech Tusq, and the Silver Leaf Maple neck accommodates a double-action truss rod and 21 medium sized frets. The neck has a low ‘C’ profile and whizzing up and down the fretboard is a breeze. 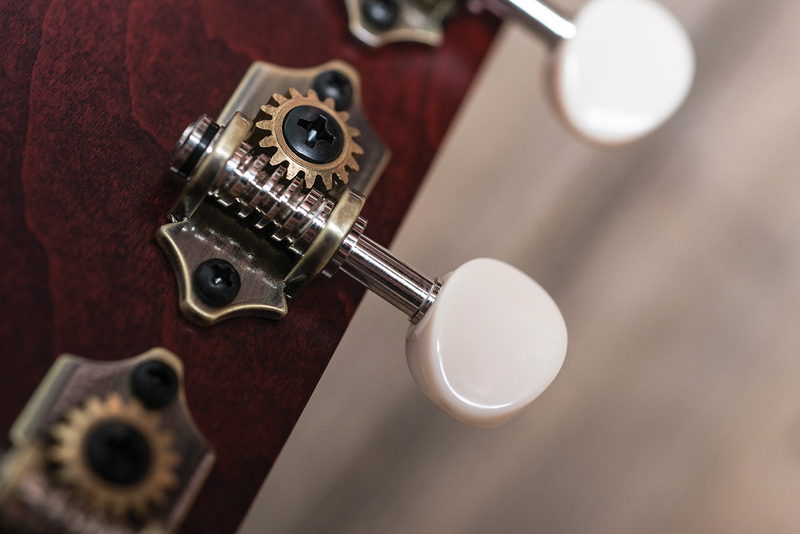 The headstock is home to open-geared, authentic brass tuners with sympathetic off-white buttons. Close inspection of the rear of the headstock gives evidence of a fairly uncommon production technique. 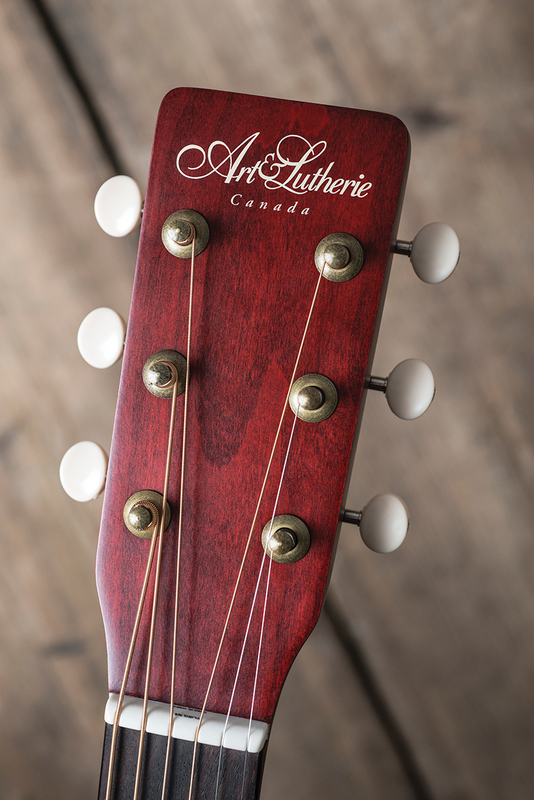 Every Art & Lutherie neck starts life as a cut, one-piece chunk of wood, but the headstock is sliced off at a 45-degree angle, spun round and then glued back on with the grain reversed. Far from weakening the structure of the guitar, Art & Lutherie states that this process actually strengthens the neck. The overall build quality of the Legacy is very good. All joints are clean and tight, and fixtures and fittings feel sturdy and robust. Inspection inside the guitar’s body did reveal a few lapses in quality control; a couple of blobs of excess glue around the kerfling, along with some wood tiny scraps of wood shavings. It’s nothing terminal, but it is a shame because externally the guitar is very well presented. As reported in our November issue, the Legacy’s younger brother, the parlour Roadhouse, had a mid-range tonality that, although perfect for bluesy fingerstyle, lacked a little versatility. The Legacy definitely has a more expressive, versatile tonality to it, but the two guitars are very much cut from the same cloth. The larger body size offers more projection and volume than the Roadhouse, but essentially the timbre is very dry and woody which, as you’d expect, makes this guitar perfect for bluesy-style fingerpicking. Breaking it down, the high-end register has a zingy ‘snap’ which helps single note runs cut through when played with another acoustic. The mids are more rounded and a smidgen warmer than expected, while the low end is present enough to handle fingerstyle disciplines, but understandably lacks the richness offered by a rosewood (or similar) back and sides – which actually means this guitar should record well. With a medium pick in hand, we gave the Legacy a ‘hearty strum’ and were impressed with the clarity and headroom offered by the Concert Hall sized body. Also notable is how well it handles varying degrees of attack when playing solos. Whether you’re really ‘digging in’ or gently brushing the string, the guitar responds admirably to the variation in dynamics. Overall, the Legacy sounds the way it looks; the vintage styling and vibe are matched by the woody midrange which was a lot of fun. The Legacy is also available as a cutaway electro loaded with a Godin Q1T pickup (£499), which is certainly worth a look if you want a Legacy model to take on stage. • Build Solid Spruce top, Wild Cherry 3-layer laminate back and sides, Silver Leaf Maple neck, 14-fret neck join, Rosewood fingerboard and bridge. 95% Canadian wood.